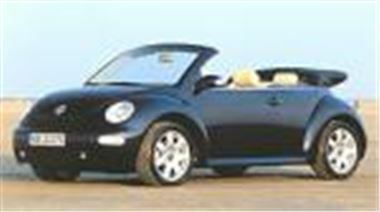 VW’s Beetle has finally got its top off and goes on sale in the UK with right-hand drive from next Spring. There will be automatic protection in the unlikely event of a rollover and VW says that the car has high torsional rigidity, all but eliminating the scuttle shake that afflicts so many soft-tops. The car will have a proper, snug, three layer hood with glass rear window. A new type of hydraulic operation ensures it can be raised or lowered in just 13 seconds. Engines will be the familiar 75bhp 1.4 16v, a 102bhp 1.6 16v or a 115bhp 2.0 8v. A 100bhp TDI PD 100 will come later.